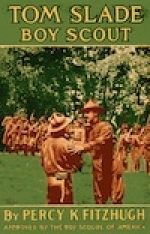 The Tom Slade series, written by Percy Keese Fitzhugh, consisted of 19 titles about Boy Scouts, written between 1915 and 1930. Tom is a sixteen-year-old street tough, left to fend for himself by his worthless father, Bill Slade, after wealthy landowner John Temple evicts them. Tom scorns the Boy Scout movement, as does Temple and his effeminate son Wilfred. Because of his interest in Temple’s daughter Mary, Tom gets a job and joins the Scouts after seeing that they are as strong and tough as he.